How? By establishing connection-enriching educational programs that would help us positively adapt to the new globally interdependent conditions. When nations’ leaders and people in general realize the extent of our global interdependence, we will be able to make great strides toward a harmonious global society. Today’s interdependent #world doesn’t require artificial representative bodies to help us get closer to each other. We ourselves can strengthen our #solidarity and cause a fundamental change in our relations. The current state of affairs is leading us to rethink the relevance of #international bodies for humanity’s betterment, as well as revise whether we should continue perpetuating the existence of organizations that primarily serve the interests of political and financial #elites. 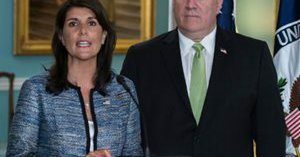 The unprecedented move by the U.S. to withdraw from the #UN #HumanRights Council marks a turning point in a new global approach aimed at reaching balance and efficiency of the world’s monitoring bodies. What will prevent us from treating #Mars just as we treated planet Earth? What if humanity’s next #frontier is a completely different #dimension of #existence? The world is one’s expression through other people. Whatever you subconsciously disseminate in the #world, you feel from the world. Evil is necessary for the existence of good. They exist in balance—it is the right relationship between cells, atoms, all creation, when consumption and bestowal are meant to complement each other so as to reveal the Creator in between. The good upper force needs a system of negative forces for correct governance, to give man free will. #Evil is a system of forces for determining the good. When you realize that it’s possible to attain the higher and the #eternal, #life becomes attainment of the goal. A permanent ten gradually becomes a cozy nest. But the safest and most protected space is infinitely open, when everything is in the Creator’s hands, who fills and actualizes everything. If you go with faith above reason, the protection comes in the Creator through the ten.